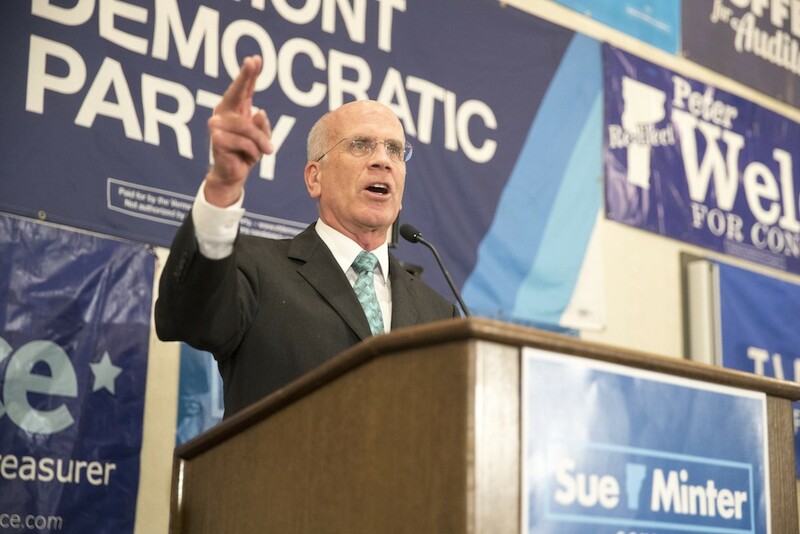 For nearly two full years, U.S. Rep. Peter Welch (D-Vt.) has answered every question about President Donald Trump and impeachment the same way: He deferred judgment until Special Counsel Robert Mueller completed his investigation into ties between the Trump campaign and Russia. So now the report is in, although not yet publicly released. And Welch has slightly modified his standard answer to, "I need to see the Mueller report." He uttered that line, or some variation thereof, a total of eight times in a 20-minute interview on Monday afternoon. Otherwise the conversation featured red-hot rhetoric on Trump and characteristic Welchian caution on taking action against the president. Welch isn't just another member of Congress on these matters. As a member of both the House Permanent Select Committee on Intelligence and the Oversight and Reform Committee, he has a seat at the table where an impeachment process would begin — and he seems a bit reluctant to assert himself. Welch's reaction to U.S. Attorney General William Barr's four-page summary of Mueller's findings? "First, Mueller found no collusion by candidate Trump. That's significant," he said, and then pivoted. "Assuming Barr is reporting accurately, I'd believe Mueller's conclusion." A bit later in the same answer, he slammed the attorney general. "Barr was chosen by Trump. It looks like Trump's confidence in Barr was well-founded," Welch said. So first he assumes Barr's honesty, and then implies that Barr is the president's errand boy. Welch frequently asserted that "so many bad things were going on" in the Trump campaign. "There were clear violations of campaign finance laws. Many Trump associates are going to jail." Despite those emphatic statements, Welch continues to defer on whether the president should face any legal consequences. And he refused to take a stand on potential obstruction of justice. "I have to see the report," he repeated. And even without the Mueller report, he's throwing cold water on the notion of impeachment. "Impeachment is a political process," Welch said. "There are no Republican votes for impeachment. The votes are not there to proceed." To drive home that point, Welch again relied on the AG's letter. "According to Barr, Mueller found no collusion," he said. "That does have real significance on the impeachment front." When asked whether Trump had committed high crimes and misdemeanors — the constitutional standard for impeachment — Welch deflected. "First, we need to see the Mueller report," he said. "Second, the term 'high crimes and misdemeanors' is a political term." Nothing about truth or justice, apparently. Welch called for a measured approach to investigating the Trump administration. "We have oversight responsibility," Welch said. "I want to know what Russia did and figure out how to fix it." On the other hand, he added, "It would be a mistake to be totally absorbed with investigations and not deal with other issues." It's true that Democratic leaders need to strike a balance. But the list of probe-worthy issues is practically endless. To name a few, the family-separation policy at the southern border and general overreach in immigration enforcement, the ethical scandals involving current and former administration officials, the undocumented millions that flowed through Trump's inaugural committee, illegal payments to women who allegedly had affairs with Trump, the granting of security clearances to his daughter Ivanka Trump and son-in-law Jared Kushner over the objection of senior officials, Trump's use of his position to tout his businesses and profit from foreign entities renting his properties, and off-the-record dealings by Trump and Kushner with authoritarian regimes such as Russia, Saudi Arabia, North Korea and China. Not to mention abundant evidence of tax, banking and insurance fraud by the Trump Organization and misuse of funds by the Trump Foundation. So, sure, Congress shouldn't be "totally absorbed" by Trump scandals, but it also has a constitutional duty to investigate potential wrongdoing by a president — and an obligation to history. Welch's committees are in a position to create a permanent record of the administration's dealings. Vermont's only member of the House is acting like the guy who, throughout the Trump years of endless confrontation, has tirelessly sought bipartisan cooperation. Which is noble. But in the current atmosphere, it's like bringing the Marquess of Queensberry rule book to a back-alley brawl. It began as a simple, focused piece of legislation. A Vermont Senate bill, S.40, calls for testing school drinking water supplies for lead and paying part of the cost of remediation. The bill arose from the troubling results of a limited testing program conducted last year: Of 900 water taps tested at 16 schools, 27 had lead levels of 15 parts per billion or more — high enough to violate the U.S. Environmental Protection Agency's standards and trigger the taps' immediate replacement. Roughly 17 percent had lead levels above the one part-per-billion recommended by the American Academy of Pediatrics. So let's test 'em all, right? Right. Despite disagreements between the House and Senate, S.40 is moving toward passage. But the questions involving lead in drinking water and who pays for necessary improvements are among many about health and safety in public school facilities. Other potential hazards include radon, asbestos, insect and rodent infestation, and mold, perhaps the most common problem in older buildings. How prevalent are such health and safety problems? We simply don't know. The state has no process for tracking them. Or any other school facility needs, for that matter. That lack of central oversight may lead to critical situations. "Every year we see two or three schools with urgent needs," said Jeffrey Francis, executive director of the Vermont Superintendents Association. Last August, mold was discovered at Prosper Valley School, an elementary institution in Pomfret. "We decided to close the school for remediation," said Mary Beth Banios, superintendent of the Windsor Central Supervisory Union. Students were shifted to a nearby school with extra space. Officials hoped to move them back by the end of last year, but that proved to be very optimistic. "We're not going to reopen the school next fall so we can be thoughtful about the steps we need to take," Banios said. The discovery of mold sparked immediate action, but emergencies can be prevented with consistent attention to infrastructure. "We should be proactive about this and avoid crises," said Banios. "Individual communities need state aid to do that." Speaking of state aid, here's a fact for you. Before 2007, the state devoted roughly $10 million a year from its capital fund to help pay for school construction costs. In most cases, the state's share was 30 percent of a project's cost. Lawmakers imposed a moratorium in 2007 because obligations to school districts had gotten out of control. The state was "in the hole" by $80 million to $100 million dollars, said Rep. Alice Emmons (D-Springfield), longtime chair of the House Corrections and Institutions Committee. The legislature called a halt to funding new projects but committed to honoring the state's promises. Paying down that backlog took 10 years, according to Emmons. In the meantime, districts have had to fund projects on their own. "We've been taking a piecemeal approach to the state of our schools," said Nicole Mace, executive director of the Vermont School Boards Association. "There's no way to prioritize school needs or create a capital plan." Many share Mace's concerns. "I'm a fiduciary for the taxpayers, but I also recognize the needs of the schools," said Treasurer Beth Pearce. "Students deserve safe, healthy, energy-efficient schools." The House Education Committee is considering H.209, which would require Education Secretary Dan French to assess school capital needs and task Pearce with devising a way to restore some measure of state aid. "What I'm trying to do is pass something to get us started," said committee chair Rep. Kate Webb (D-Shelburne). "We have to inventory our needs and figure out how to pay for them." Emmons, whose committee oversees capital spending, is not optimistic. "The capital bill is stretched already," she said. "We want to decrease Vermont's debt exposure." She also noted the likely opposition to creating a designated revenue stream — that is, a new tax or tax hike. Further, Emmons noted that during the moratorium, the Agency of Education cut its building staff. "There are no people who can administer a state aid program," she said. Even the agency's old rules and standards may need an overhaul. A solution seems to be a long way off, at best. Meanwhile, as Pearce noted, "the average Vermont school is 42 years old, and one-quarter are in poor condition." "It's a can of worms," said Emmons. Speaking of indoor health and safety, the Statehouse suddenly has an issue of its own. During Town Meeting week, the Department of Buildings and General Services conducted routine tests for radon in the capitol building — and four of 20 air samples tested well above the EPA's recommended action level. The results were reported to lawmakers in a March 20 letter from Sergeant at Arms Janet Miller and BGS commissioner Chris Cole. The high readings were taken in the sergeant at arms' office, two nearby committee rooms (Senate Institutions and Senate Government Operations) and a mechanical room in the basement. "Breathing air with radon increases the risk of lung cancer," said Michelle Thompson, public health industrial hygienist at the state Department of Health. "Radon can build up if you don't have sufficient ventilation." The next step is to test areas served by an air handler in that basement room, to see how extensive the problem is. The process will take until early April. In the meantime, officials say there's no need to panic. "According to the health department, we need to do something about it but they're not overly concerned," said Steven Hubbs, environmental health and safety coordinator at BGS. The extent and cost of the remediation won't be clear until the tests are done. "Typically, you would install an active soil depressurization system," said Thompson. That involves drilling a hole into the soil and installing a vent pipe to disperse the radon gas outside the building. The price tag shouldn't be too extreme. Thompson said that radon remediation at school buildings has run $10,000 to $20,000. "It's something we can fix without too much trouble," said Hubbs. In the meantime, don't be surprised if Miller occasionally opens the windows in her tiny office.